Banbridge Town can finally lift themselves out of the relegation spots with a win on Saturday. They host Dundela at Crystal Park (kick-off 2pm), knowing a win would see them out of the bottom four and possibly even beyond the ‘definitely maybe’ 10th spot, which may lead to the trap door. “It’s another home game that we need to take three points from to get us up the table,” said boss Ryan Watson. 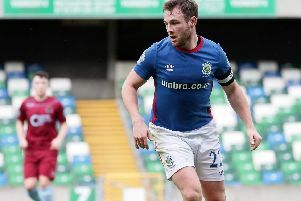 “This is a huge game because Dundela are down there with us. To win this one would be another big step in the right direction. Town, of course, have stretched their unbeaten run to five Championship Two games and beat Wakehurst in their last game before a week off.